The multitasking actress plays a version of herself—a starlet off camera on location at Paramount—and talks cats, Karl Lagerfeld, and her signature DIY makeup. 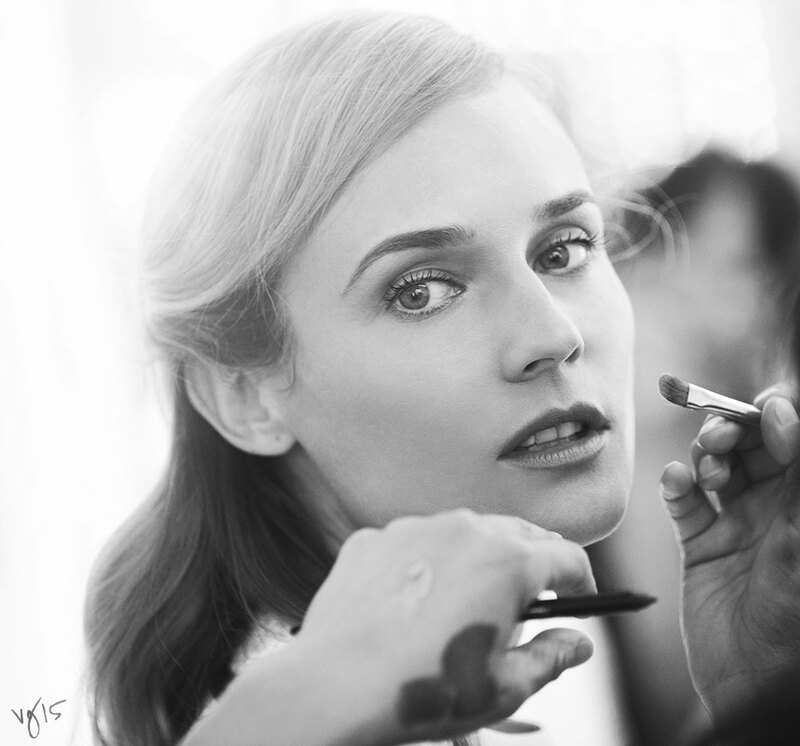 It’s 10 a.m. on a Tuesday when Diane Kruger—multilingual actress, Chanel ambassador, and international style star—arrives at Paramount Studios in Hollywood for her cover shoot with The Violet Files. She’s holding a coffee in one hand and a yogurt parfait in the other, characteristically chic in a short yellow Giambattista Valli dress. Her blond hair is washed but undone (she says it’s naturally terrible). The weather is unusually hot for Southern California, and although they say it never rains here, a sudden shower does less to cool things down than add to the humidity index on set. It’s always nice to talk to another cat lady. Karl [Lagerfeld] politely tells me Hobbes is cute, even though he’s probably appalled at how tubby he is. Hobbes is on his own for the moment. Within days of wrapping her shoot for The Violet Files, Kruger and longtime partner Joshua Jackson jetted off to Venice for the Film Festival, where she served on the jury. It was the kickoff to a season of red carpet events and press junkets, where, unlike many of her counterparts, Kruger acts as her own makeup artist and stylist. “I was always surrounded by great makeup artists when I was modeling and learned a lot from them,” she demurs. “I try to not overdo it and let the dress do all the talking. I’m really not into contouring and heavy foundation, but I have a pretty thick brow naturally and find that it gives me a lot of character.” If the world doesn’t like it, Kruger’s not bothered, although generally she can do no wrong. The crystal-and-cape-embellished custom Prada number she wore on the festival’s opening night, for example, charmed even the most bitter cynics. Kruger was judging—not competing—in the festival this season, but still came away with honors, as more than one fashion writer named her Venice’s “Winner of the Red Carpet.” Prepare to be dazzled. Who or what do you prefer to wake up next to? My lover. And my cat is there whether I like it or not. Every morning, 6:30. I like the dry shampoo or the texturizing spray by Oribe. If you were to have your own perfume, what would you call it? Thai massages, and Pho—especially when I’m hung over. I think I’d love to be a scientist, and if I’m not smart enough, then maybe Peter Pan. What’s the last dream you had? The last dream I had was unfortunately a nightmare. It was probably in English—I dreamt my teeth kept falling out. I woke up totally disoriented. What do you think of when you think of red lipstick? Usually Paris. It’s something I often wear there during the day. I think it would have to be a mix between Audrey Hepburn and Courtney Love. Who’s a woman that you’d like to steal a feature from? I’d love to have Cate Blanchett’s voice. It’s so haunting. I watched the Carol trailer and her voice in that...I just love her, she’s great. I have a pretty thick brow naturally and find that it gives me a lot of character. Magnolia, Les Choses de la Vie, which has Romy Schneider in it, and Dirty Dancing. Perrine Rougemont! She’s French, and she’s been doing my hair on photo shoots since I was sixteen. I’m really picky with hair, and have terrible hair, and she really knows how to do it and she’s also a really, really nice person. I just can’t stand having a weird energy when I’m already sort of stressed out to go on the red carpet. I feel very safe with her. Just live. You can’t turn the clock back; you just can’t. What's the first thing you notice when you meet a new person? Cocktail hour. I love a Grey Goose martini with a twist. “Don’t be scared to be scared.” A veteran actress said it to me on my first job as an actress. I was scared and froze and I was mortified. It made no sense then, but I understand it now and it’s true. Who would you like to have paint your portrait? Makeup artist Kara Yoshimoto explains how to replicate the makeup from The Violet Files’ shoot.